Since June 1995, it has been stipulated that products designed to protect users from health and safety hazards must be CE marked before they can be sold in the European Community. Such products are called Personal Protective Equipment (PPE) and are covered by the Personal Protective Equipment Directive 89/686/EEC. This EC Directive defines the regulations and procedures required before a PPE product may be CE marked and placed on the market. It includes a set of health and safety requirements with which all PPE must comply. The responsibility for ensuring that the Directive is adhered to falls upon the manufacturer. The Directive is enforced in the UK by the local authority Trading Standards Service. Failure to comply can lead to up to three months in prison and/or a fine of up to £5,000. Furthermore, manufacturers can be required to recall and replace any equipment found to be faulty. The CE mark is the manufacturer’s claim that their product meets the requirements of the directive. It is illegal to CE mark a product that does not comply with these requirements. The CE marking process is different for each category. For all categories, conformance with the requirements of the Directive must be declared in writing, and a technical file must be compiled (technical files are explained below). For intermediate and complex design products, an independent assessment of the product is also necessary. This process is called an EC Type Examination, and usually involves testing against a harmonised European standard in order to prove conformance with the requirements of the Directive. For complex design products only, there is a further requirement that production is independently monitored to ensure that quality levels are maintained after the CE marking license had been granted. This is achieved through regular factory inspections, or approval of a recognised quality control system, both of which must be carried out by competent authorities. The vast majority of footwear PPE falls into the intermediate design category. There are some exceptions, however, such as footwear for use in dangerous situations, for example, boots worn by fire fighters, which normally fall into the complex design category. It should be noted that the protective footwear standard is to be withdrawn. This is due to improvements in footwear and materials technology, as safety caps now offer the aesthetics of protective ones, meaning they are less cumbersome and fit as well into modern designs. Following successful completion of the relevant testing programme, a technical file must be compiled and assessed by a Notified Body appointed by the government of an EC member state. The Notified Body has the authority to issue an EC Type Examination Certificate, which is effectively a license to CE mark the product. The technical file is held by the Notified Body until at least 10 years after the last placement of the product(s) on the market. Upon successful assessment of the technical file, a document called an EC Declaration of Conformity must be submitted to the Notified Body. This is a legally binding document, which states that the product is in conformance with the PPE directive. Changes to the product are not permitted without further testing and re-certification. Manufacturers located outside the European Community (EC) must have an authorised representative established within the EC. As well as the CE mark, various other markings must be present on the footwear, as defined by the relevant harmonised standard. An information notice to the user must be supplied with each pair of footwear sold. This is a document that explains the protection provided and other details such as care guidelines. The labelling codes applicable to European safety footwear are outlined in the following table. Products for which certificates are granted may be CE marked and sold freely throughout the European Community. Under the current version of the PPE directive, certificates remain valid for 10 years. This is expected to change when the directive is next revised, possibly reducing the validity limit to five years. Footwear must be fit for purpose. This phrase means the product should be fit for all its intended purposes, including any indicated by the retailer. Testing is an important step in proving the fitness of purpose of conventional and safety footwear. The different classes described previously are subject to different testing programmes in accordance with harmonised standards. Within the European Union, safety and occupational footwear is tested against EN ISO 20345:2011 and/or EN ISO 20347:2012. Completion of the relevant programme of testing is the first stage in the EC Type Examination. PPE footwear testing should be performed at an accredited laboratory. Safety boots with toecaps present give added protection to the wearer. This protects the foot from falling objects, crushing injuries, or other hazards. Although traditionally made of steel, the reinforcement can also be made of a composite material, or a plastic such as thermoplastic polyurethane (TPU). Steel-toed boots are important in the construction industry and many other industrial settings. Sample preparation The specimen is obtained by completely removing the toe portion of the footwear by cutting across the width behind the back edge of the protective toecap, leaving a three centimetre gap away from the toecap on the outsole. A plasticine (modelling clay) cylinder is positioned inside the specimen directly under the point of pressure. The specimen is placed on the base of the test apparatus in such a way that the central point of test will be the highest point of the toecap. The placement of the plasticine cylinder is determined by the standard and measurements taken from the shoe itself. Two different types of tests for the toecap are impact resistance and compression resistance. Impact resistance The impact resistance test delivers a sudden blow to the sample and is achieved by impacting the toecap with a specified energy, which is measured in joules. The striker has a mass of 20 kg and the nose of the impactor is a steel wedge, delivering a total impact energy of 200 joules. The test apparatus drops the weight from a height of approximately one metre onto the prepared specimen. Compression resistance The compression resistance test differs from the impact test, by applying a steady and increasing load to the sample using two steel plates until 15,000 newtons is achieved. Once this load pressure has been obtained, the measuring process is the same as for the impact test. The toecap test is performed and the plasticine is carefully removed. The minimum height of the plasticine is measured. This determines if the toecap has fulfilled the Grade or Class requirements of the standard. The outsole is tested for slip and penetration resistance. Slip resistance Slip resistance is a critical element of the safety testing of footwear. As consumers and workers become more aware of their rights, there is an increasing chance of litigation. It is essential that footwear manufacturers test the slip resistance by measuring the coefficient of friction between the sole and different types of flooring. This key test is in accordance with the British Standard EN ISO 13287- Standard test method for static and dynamic coefficient of friction of materials (slip resistance). It covers the determination of the coefficients of starting (static) and sliding (dynamic) friction of materials when sliding over other substances at specified test conditions. The procedure permits the use of a moving sample with stationary plane. The machine used to conduct slip resistance testing incorporates a specially-designed control and data acquisition system, which provides the test technician with the coefficient of friction for each test performed on each sample. The equipment also provides a graphical representation of the test data. Measurements of frictional properties may be made on materials when sliding over another substance. The coefficients of frictions are related to the slip properties of the materials under test. The slip resistance test can determine the anti-slip properties of the safety footwear being tested. For PPE footwear two types of flooring and lubrication are used. International test standards and methods for assessing slip resistance exist to provide the industry with consistent testing and assessments of products. Slip resistance is complex, with many variable factors to consider. Once the results are obtained, they are compared to the requirements and a category of protection is established. Penetration resistance As an additional category of protection an insert can be placed in the bottom of the shoe to protect the wearer against sharp objects penetrating through the outsole and injuring the foot. In the construction industry, for example, building sites may be littered with sharp nails or screws, which could prove to be a potential hazard. Penetration resistance is performed on safety footwear with steel inserts or non-metallic inserts. The upper is removed from the sample and the outsole is tested. On each shoe of the pair (left and right), four areas of the outsole are tested: inside forepart, outside forepart, centre area, and the heel area. The test is repeated across the size range of the footwear. The outsole is tested by forcing a test nail with a blunt tip through the outsole and inserting it until a minimum force of 1,100 newtons is reached on non-metallic inserts or exceeded on metallic inserts. Additionally, the tip of the nail should not be visible through non-metallic inserts at 1,100 newtons - only then does it pass the test. The test nail is a calibrated piece of equipment with a minimum hardness of 60 HRC and a diameter of 4.5mm. The shoe must also conform to design requirements such as size (to ensure it covers the bottom area of the foot) and flexing (ensuring continued durability and corrosion) to stop the material degrading over time. The tongue label will have the letter ‘P’ or ‘S3’ stated on it. This informs the customer that the necessary category of protection has been met. Antistatic test Antistatic is an additional category of protection denoted by the letter ‘A’ or S1, S2 or S3 on the tongue label. Antistatic footwear allows the dissipation of electrostatic charge through it and avoids the risk of spark ignition when dealing with flammable substances, vapours or explosives. Because atmospheric conditions can affect the electrostatic build-up within the footwear, the shoe is conditioned in very moist (85% relative humidity) and very dry (30% relative humidity) atmospheres before testing, to ensure the boots work in variable conditions. Then the resistance is checked and compared to the requirements of 100KΩ to 1,000 MΩ. Anything above or below this will fail the test. The equipment used to measure the electrical resistance should be capable of measuring an accuracy of 2.5% while applying a voltage of 100 V DC (voltage of direct current). The sample is rested on a copper contact base plate, which houses the external electrode. The shoe is filled with a total mass of 4 kg of stainless steel balls/ball bearings (which conform to ISO 3290). The internal electrode is rested in the forepart area, as forward as possible, nestled within the steel balls. (See picture for demonstration of set-up.) 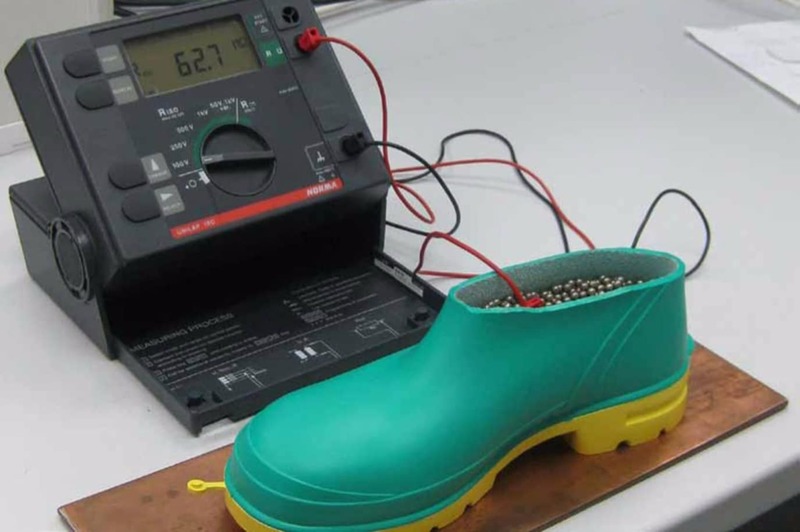 The test voltage of 100 V DC is applied between the copper plate and the steel balls for one minute before recording the electrical resistance of the footwear sample. Testing against the existing standards for the EU involves assessment not only of the protective features but also of durability and user comfort. Most of the main components must be tested and the majority of the tests are performed three times to cover the size range of the product. The number of samples required to complete the testing varies depending on the exact nature of the product, but typically nine pairs is sufficient (three pairs of the smallest size in the size range, three pairs of the largest size and three pairs of a middle size). Safety footwear specimens should be re-tested for classification for any of the following changes: change in materials, cap manufacturer, design of toecap, construction method used to make the footwear, upper or insole material thickness greater than 25%, soling system, hardness in the outsole and shape of last used in the manufacturing of the footwear. For the European and North American (the USA and Canada) markets, suppliers must meet legal obligations required of them to place only safe products on the market. Other regions of the world appear to be following suit.